Held on the March 17th every year, St. Patrick's Day is the celebration of one of the patron saints of Ireland - St. Patrick. This religious and cultural holiday is celebrated around the world with parades, dancing and plenty of drinking. Although Guinness and Whiskey are classed as the traditional drinks of the Irish, there are many delicious cocktails you can add to your menu to celebrate for St. Patrick's Day. Have a look at our recommended cocktails. We have listed a variety of tastes, so regardless if your customers like a short, sour cocktail or a strong and long one, we have got you covered. There is no better whiskey cocktail than a whiskey sour. The sugar and the lemon should balance each other out, giving a delightfully bitter-sweet taste. 1. Pour the ingredients in the Boston glass, add the cubed ice and place the boston tin on the glass. .
2. Hit the tin securely on the glass and shake. 3. Add fresh ice to the whiskey glass. Using the strainer, pour the whiskey sour into your glass. 4. Garnish with your lemon slice and cherry stick. Tip: If you want your whiskey sour a little sweeter, add 12.5ml more of your sugar syrup. Be warned - this cocktail is strong! Whilst it is a long cocktail, it contains a lot of spirits. If you are searching for a bright green drink for St. Patrick's Day, look no further. 1. Chill a hurricane glass for a few minutes. You can do this by adding some cold water or putting it in the fridge. 2. Pour out the ice and water. Add some fresh ice around 2/3 of the glass. 3. Add your ingredients together. Using your bar spoon, stir until mixed. 4. Garnish with an orange slice and a cherry. Tip: If you do not wish to use orange juice, opt for lemonade instead. Love it or loathe it, you cannot celebrate St. Patrick's Day without Guinness. If your customers are not sold on having a pint, then you must try this Guinness martini. It's a combination of Guinness, coffee, vodka, rum and a hint of chocolate. 1. Chill a martini glass for a few minutes. 2. Add all your ingredients in the boston glass. Add ice and secure the boston tin onto the glass. 3. Shake well for around 2-3 minutes. 4. Tip out the ice and water from the martini glass. Strain your mixture into the glass. Tip: The harder your shake, the more froth your martini will have. Layered shots are great for impressing your customers. Not only do they look fantastic but they are delicious. There are a variety of layered shots, but this St. Patrick's Day, opt for a Baby Guinness or an Irish Flag Shot. Instead of a 25ml shot glass, go for a 30ml or 35ml one. The extra ml will give more room for the top layer. This shot is great to look at if layered correctly. It looks just like the Irish flag and is a great shot to celebrate St. Patrick's Day with. Use the same method as your baby guiness shot. It will be a little harder to layer as the Irish Cream is in the middle, so an extra stready hand is needed for the top layer. Stick to the technique in the video and it will layer beautifully. As it is still cold in February, there's nothing better than a warming drink. This caramel Irish coffee takes a mouthwatering twist on the traditional alcohol beverage. The addition of butterscotch adds a sweet hint that doesn't overpower the rest of the coffee. 1. Pour boiling hot water into an Irish coffee glass for 2-3 minutes. 2. Tip out the water. Make the coffee to the desired strength. Add the Irish cream, whiskey and schnapps and stir for a minute or so. Leave around 1.5cm room from the top of the glass. 3. Add the whipped cream. 4. Drizzle the caramel sauce for the finishing touch. Tip: Use double cream so it will float on the coffee. Whip the cream until it is a little stiff. It will float if your coffee is boiling hot and the cream very cold. A cocktail for those looking to celebrate the 17th alcohol-free. This Patrick's Martini tastes delightful and is bright green. A winner all round. 1. Fill a martini glass with ice and cold water to chill the glass. 2. 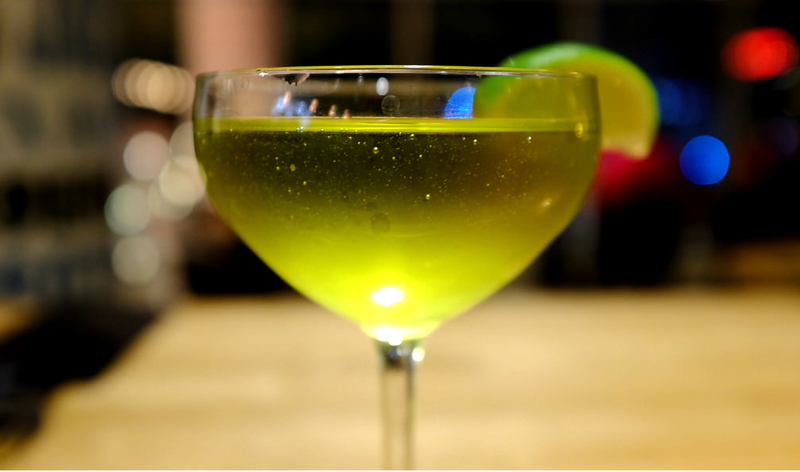 Fill your boston glass with the lime juice, syrup, apple juice and food colourings. Fill with ice and secure your boston tin in place. Shake until cold. 3. Empty your martini glass. Strain the mixture into your glass. Top with soda. 4. Garnish with a lime slice. 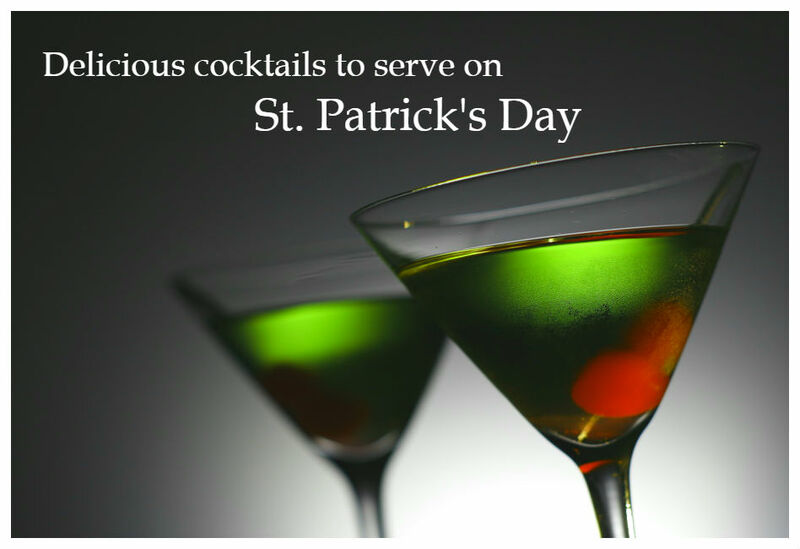 Have you got any cocktail recipes for St. Patrick's Day? Let us know in the comments below.